Can you answer these questions about establishing credibility as a leader? Leaders become leaders for one reason: they have people who follow them. While some leaders forget this simple truth, the best leaders work to build both authority AND credibility. 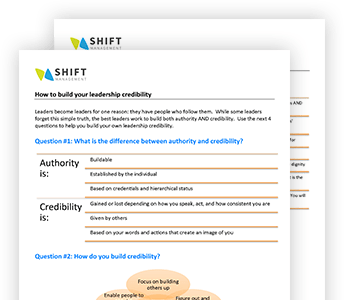 Use these questions to help you remember the video and build your own leadership credibility. Question #1: What is the difference between authority and credibility? Question #2: How do you build credibility? Question #3: What gets in the way of establishing credibility? ACTION ITEM: Building credibility is a result of your actions over time. What can you do to help someone around you accomplish one of their goals? Why not get started today?